I figured it was about time to impart some of my window treatment knowledge. I find it's one of the design elements of the room that actually gets very little thought. When really, blinds control the amount of light in a room- which in turn affects all design elements of the room. I like to think of window treatments as soft walls- as they are a part of the room and deserve proper consideration . One of my favorite soft wall applications are cellular shades- blinds that effortlessly combine both style and function. 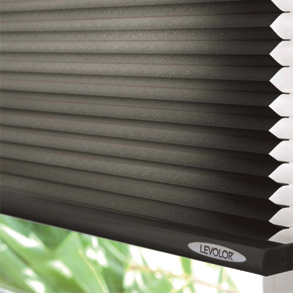 So, what exactly is a cellular shade?- It's an accordian shaped blind with pocketed cells that provide privacy and energy efficiency. They trap warmth in winter and keep it cool in the summer- pretty nifty. I had a customer in December do his entire house in cellular shades- he came back in January to say that he noticed his house was 5 degrees warmer after installing the shades. The best places to install them are casual living areas- bedrooms, living room, entryway. I would stray from using them in a kitchen or bath, as they don't clean up well. 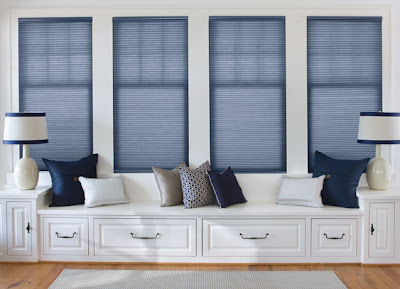 Consider installing a set or two in your home:- aside from being energy efficient, these blinds also have the potential to become cordless- keeping dangerous cords away from little hands, and giving a very clean and modern presentation. Blinds and shades are like curtains. They improved the appearance of window and keep sunlight from view for privacy purposes.